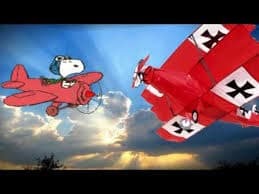 There’s a great exhibit at the Elmhurst History Museum that runs from March 23 through June 17; and it showcases none other than Snoopy and the Red Baron! Anyone familiar with the Peanuts comic strip and TV shows knows that mild-mannered Snoopy has an alter ego, the Flying Ace. As this steely World War I-era pilot, the Flying Ace is determined to shoot down his nemesis, the Red Baron. This fun exhibit will give you an inside look at how Charles Schulz developed the characters of Snoopy, the Flying Ace and the Red Baron. At Elmhurst Toyota, we think this exhibit will appeal from everyone from youngsters to the young at heart. At the Snoopy and the Red Baron exhibition, you’ll learn how Schulz was inspired to draw a flying cap and goggles on Snoopy because of his son Monte’s interest in World War I aircraft model kits. Schulz researched World War I extensively so that his characters were as authentic to the time period as possible. The exhibit includes artifacts from World War I as well as film clips and photos of actual Sopwith Camels, the plane Snoopy imagined flying from atop his doghouse. Since the Flying Ace and the Red Baron were introduced to comic strip readers back in 1965, there have been many Snoopy Flying Ace figures, toys, books and other collectables. You’ll get to see this memorabilia and high-resolution reproductions of Snoopy’s many adventures in Schulz’ comic strips. Even Snoopy’s doghouse is on display, complete with the Flying Ace’s goggles and aviator cap. You can try them on for size and take selfies next to Snoopy’s doghouse. Elmhurst is the first stop of the Snoopy and the Red Baron exhibit, which is on loan from the Santa Rosa, California-based Charles M. Schulz Museum and Research Center. Santa Rosa and Sonoma were among the many towns devastated by recent California wildfires, and public schools in the area lost many teaching materials. During Snoopypalooza (the week of March 24-31), the Elmhurst History Museum will collect funds to support Creative Sonoma’s Teaching Artists Recovery Project, a non-profit organization created to help public schools that were impacted by fire. This exhibit is free and fun for the whole family. While visiting the museum, you’ll also have the opportunity to help bring art back to California students in fire-damaged schools. Admission is free. Money may be donated to the Creative Sonoma’s Teaching Artists Recovery Project in the museum’s gift shop or online: https://www.creativesonoma.org/recover-fund. Call 630-833-1457 or go to the museum’s website at www.elmhursthistory.org/317/Upcoming-Exhibits.